As any company can tell you, the product is only as successful as the marketing, and Los Angeles took it to heart. Not only was designing a good transit “product” important, but selling it to the public was immediately useful. Other agencies would do well to do the same. Traffic calming is a wonderful concept. Given the recent deaths and injuries around Marin caused by drivers hitting pedestrian, it may be time for cities up and down 101 to take a look at calming traffic. How many parking spaces are there in a city? One intrepid doctoral candidate found out. One of the reasons for SMART’s higher-than-expected cost is Federal crashworthiness standards that forced the agency to look for custom-built heavy DMUs. Yet, as explained by Market Urbanism, the regulations were made for a time before intelligent, lightweight materials were available and force the US to forego the engineering standards used everywhere else in the world. As shown above, the new materials are perfectly capable of keeping vehicles safe. It’s too late for SMART to change their order, but this regulatory regime can and should be changed for all the other transit agencies looking to hold down costs. In case you missed it, there were off-year elections this past Tuesday. Urbanism won the day for the most part, fending off avowed anti-city challengers in Novato and San Anselmo. Many disagreed with San Rafael’s new mayor, Gary Phillips, on Target but he has a firmly pro-business stance and will serve downtown San Rafael well. Across the country, Greater Greater Washington looks at what makes a candidate electable, the Center for Transportation Excellence has posted the status of transit measures nationwide and Half-Mile Circles looks at a few of the big-ticket items. The County is considering regulations on smoking within multi-unit dwellings, I guess because a home is only private space when it’s got a half-acre of land around it. There will be no Terrapin Crossroads, says Phil Lesh. Fairfaxians are heartbroken. A driver struck a teen in Novato last week along pedestrian-unfriendly Novato Boulevard. He’s doing okay, although he’s also lucky to be alive. SMART plans to spend up to $200,000 to polish its image and push back against opponents. Novato’s Hanna Ranch development would be built without affordable housing while creating low-income jobs. This is suspiciously inconsistent. Deciding on final approval, meanwhile, has been punted by the Council to November 29. California may have a massive infrastructure maintenance deficit, but at least Mill Valley is behaving responsibly. Mill Valley’s Chamber of Commerce plots a comeback. A proposal has surfaced to create dedicated, separated bus lanes on Van Ness Avenue, speeding buses along the corridor with significantly more efficiency than currently allowed. Since Golden Gate Transit uses Van Ness for a number of its lines, this change would benefit Marinites as well as San Franciscans. 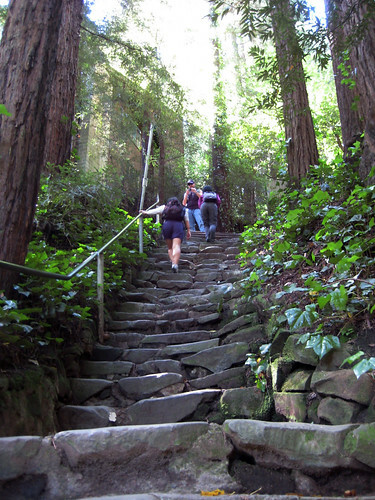 Want to save a state park otherwise slated for closure? Stop by the Parks Coalition brainstorming session on November 15. If there’s one thing Marin does well, it’s loving local businesses. 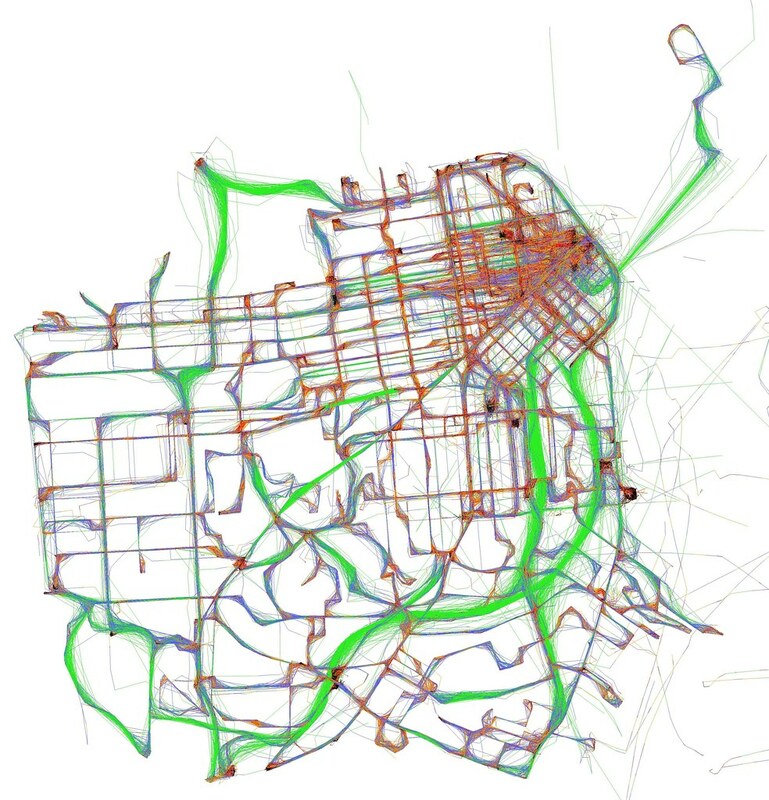 Using open, real-time location data, Eric Fischer mapped the speeds for the transit system. Click to enlarge. Cotati is considering revamping a short stretch of Old Redwood Highway near their hexagonal downtown to make it more pedestrian-friendly and less of the car thoroughfare it currently is. Local businesses want to entrench the 40 MPH status quo. The City of Napa is considering something similar: a $38 million redesign of their downtown. San Francisco apparently boasts three of the best bars in the world, and there’s no better way to enjoy a bar than to take transit. Don’t stay out too late, of course: your last bus to Marin leaves at 12:30am. Oakland residents are dedicated to historic preservation, going so far as to wield shotguns to defend their heritage. Shockwaves from the $98 billion (nominal) price tag for California High-Speed Rail continue to ripple through the blogosphere. On one side are engineers, who say it is far, far too overbuilt, and on the other are those who look at the big picture to argue it’s still a good deal. I say, if you can save money by foregoing massive viaducts through San Jose, forego the viaducts. Sacramento might not get its rail line for a while yet, but where to locate a station is still troublesome for officials. We love our green initiatives. Unfortunately one of the most popular, Cash for Clunkers, was a bust. Congress did something bipartisan today and unanimously passed out of committee a two year extension of the federal transportation bill, MAP-21. Bad traffic designs that create gridlock create exhaust which seems to hurt our neurological health. Lastly, in a testament to how budget cuts can even cut efficient programs, the General Services Administration no longer will have the money to make their headquarters an example of solid office design and will instead remain in the big, bureaucratic office building that looks just like you expect. A beautiful video from Marin photographer Gary Yost shows everything I love and miss about my home: the nature, the towns, the Bay, the culture… I miss it all. On to the nitty-gritty of running all that. SMART, once again, features prominently in local transit news this week. Farhad Mansourian, interim General Manager of SMART, has been hired by the agency on a permanent basis. Critics have addressed his pay – over $300,000 per year in compensation, comparable to other agency heads – and his credentials, although they’ve also stopped saying he duped the board prior to the MTC and TAM bailout hearings, as few boards would hire a man they felt had misled them. Cyclists and pedestrians got a major boost when the County allocated $8.8 million for pedestrian and bicycling improvements across Marin. Among the projects: studying reopening the Alto Tunnel between Corte Madera and Mill Valley, improving sidewalk connections between the Canal and downtown San Rafael, and, in a major victory, constructing the Central Marin Ferry Connection. In affordable housing news, Assemblyman and Congressional contender Jared Huffman’s bill to allow foreclosed housing to count against affordable housing mandates is on the Governor’s desk for signature. The bill once allowed cities to appeal their density requirements, but it’s been pared down to just the foreclosed housing portion. Meanwhile, Novato, which pushed most strenuously for reform, is following through on a 2008 development loan to expand Eden Housing, an affordable senior center home. Critics contended that old folks will cause crime and join gangs. Terrapin Crossroads, the Phil Lesh-led music venue, was discussed at length at a Fairfax Town Council meeting. Critics were concerned about traffic and noise at the site, while supporters saw it as a fabulous opportunity for the town to improve nightlife and remove an abandoned, but prominently placed, gas station. Lesh had put it on hold after signs opposing the project were placed along his walking route in Ross, spooking him and his wife. Plans are available here (PDF). The Marin Agricultural Land Trust purchased a large ranch outside Tomales recently, completing the greenbelt around the town and further ensuring that West Marin is off-limits to sprawl. Speaking of sprawl, the proposed Hanna Ranch development in Novato passed the city’s Design Review Board, the first step towards project approval. Some anti-sprawl might come to San Rafael, as local developer Monahan Parker is looking to build a four-story, 41-unit mixed-use building at 2nd & B Streets. Two Victorian-era homes that have seen much better days would be demolished. The project would also include a 57-space parking garage, which is one space above the minimum for a project of its size and totally out of whack with the overall setting. It is currently before the Design Review Board, and you can watch preliminary comments here. The debate over California High-Speed Rail is still a thing, and it’s making national news. Ezra Klein of the Washington Post provides a good rundown of current thought on the subject, while CAHSR Blog looks to BART battles in Livermore for signs of things to come. BART is still fighting protestors over police brutality and cell phone censorship. It boiled over recently with multiple stations being shut down during rush-hour. In case you hadn’t heard, there’s a battle brewing over transportation funding in Congress thanks to the soon-to-expire gas tax. Mercury News wonders what it would do the Bay Area. SMART isn’t the only transit agency facing problems: Vancouver’s TransLink has funding issues, Atlanta’s MARTA system is under fire from the car-dependent, and Washington, DC isn’t sure how it should align one end of its planned streetcar line. Looking to the Old World for how to structure urban spaces. Someone read the entire Seattle land use code and came away with some observations. A braver man than I.